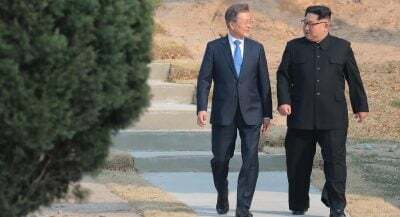 On Friday (Korea Time), the leaders of North and South Korea, Kim Jong-un and Moon Jae-in, met at the truce village of Panmunjom for a historic summit that many Koreans believe could end the war and state of belligerence that has plagued both sides of the Korean Peninsula since the late 1940s. Kim’s symbolic crossing of the border into the South could also pave the way for another precedent-shattering event: the planned summit in early June between Kim Jong-un and President Trump. If all goes well in the consecutive summits, the talks could end the threat of war—nuclear war—between North Korea and the United States and usher in a new era of peace in Northeast Asia. To Korea hands who have seen tensions rise and fall over the years, the upcoming summits are a remarkable sign of progress toward ending a North Korean nuclear and missile program that started in the late 1980s to create a deterrent against the United States and succeeded in 2017 beyond anyone’s dreams in Pyongyang or Washington.